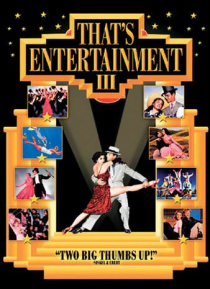 This third installment of the hugely successful "That's Entertainment" trilogy sets its sights on musical numbers from MGM's vast library of classics that never made it to the big screen, either because of their controversial subject matter or due to creative differences. Includes Debbie Reynolds' solo performance cut from "Singin' in the Rain," Fred Astaire's flawless rehearsal footage, and a Len… a Horne bubble-bath scene deemed too risque. Features rare behind-the-scenes footage to show how MGM created the screen's greatest musicals. Hosted by legendary stars: Gene Kelly, Debbie Reynolds, Lena Horne, Howard Keel, Ann Miller, Cyd Charisse, Mickey Rooney, Esther Williams and June Allyson.